Watch: The Dora the Explorer movie trailer has dropped. The first trailer for the new Dora the Explorer movie is surprisingly action-packed. If you ever wished for the beloved animated TV series Dora the Explorer to be re-imagined for the big screen with a Tomb Raider edge, then someone has been reading your dream journal, because that’s exactly what we’re in for. 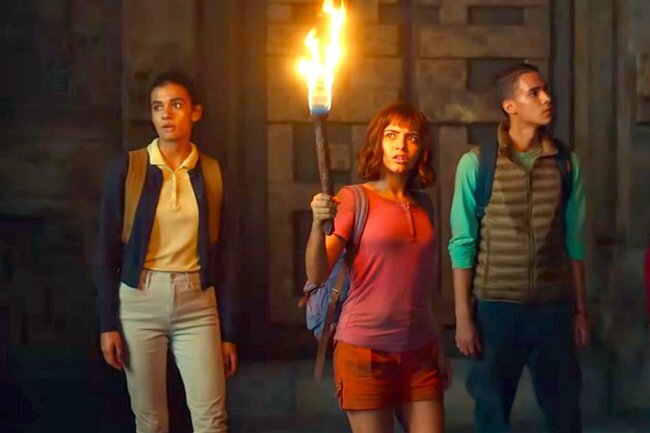 The first trailer for Dora and the Lost City of Gold, the live-action Dora the Explorer movie, has been revealed and it’s a whole lot more action-packed than we could ever have predicted. Feast your eyes on the first trailer for Dora and the Lost City of Gold. If you grew up watching the original series, you’ll see enough little touches carried over from the animation to the big screen, including cameos by Boots the Monkey (voiced by Danny Trejo), Dora’s trusty backpack and the fact that she’s still rocking that iconic bowl haircut. Dora and the Lost City of Gold has aged up our fearless heroine a bit since the last time we saw her on screen. In this iteration of the story, Dora (played by Isabela Moner) is sent away from her jungle-based home to attend high school for the first time while her parents (played by Michael Peña and Eva Longoria) set off on a quest to find a lost city of gold. Along with her now city-dwelling cousin Diego (Jeffrey Wahlberg) and two of her new classmates, Sammy (Madeleine Madden) and Randy (Nicholas Coombe), Dora sets out on an adventure to solve an impossible mystery behind a lost Inca civilization after learning that her parents have gone missing. Dora and the Lost City of Gold, which was filmed in Australia, is packed with plenty of surprises and leaves viewers with a few questions… like why does she take a backpack full of items that look like weapons along to her first day of school? I guess we’ll have to wait until the movie hits cinemas to find out. Dora and the Lost City of Gold will play in theatres across Australia from September 19.